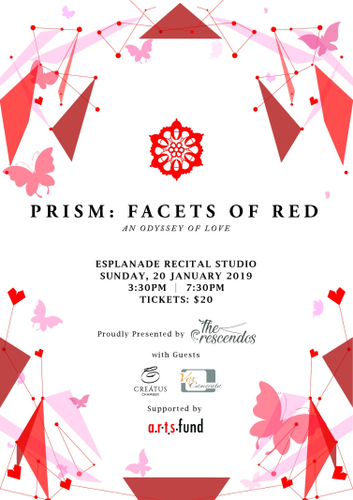 This January, explore kaleidoscopic music as The Crescendos presents the first of our concert series—Prism: Facets of Red, alongside Vox Camerata and Creatus Chamber Choir. The concept of ‘Prism’ symbolises characteristics of music we can all relate to and identify with. Join us as we embark on a journey of introspection through the lens of our music, while invoking the flavours of humanity. Drawing on the visual spectacle of 'Prism', we hope to present the various hues in the years to come with this flagship concert series. We begin with the first hue in the spectrum: Red. The colour of passion and symbol of love. In this first concert of the series, we explore the many facets of the emotion—God's unconditional love, man's devotion to God, brotherly friendship, maternal bond, adoration of nature, and the passions of romance. Enjoy songs such as Vita de la Mia Vita by William Hawley, Kiss the Girl by Alan Menken and Howard Ashman, as well as hymns of sacred Marian songs like Ubi Caritas by Ola Gjeilo and Bogoroditse Devo by Rachmaninov. Mark your calendars and celebrate this vibrant expression of humanity through our music! For more information, check out our event page.